Kali Yuga (Sanskrit: कलियुग, translit. kaliyuga, lit. 'age of Kali') in Hinduism is the last of the four stages (or ages or yugas) the world goes through as part of a 'cycle of yugas' (i.e. Mahayuga) described in the Sanskrit scriptures. The other ages are called Satya Yuga, Treta Yuga, and Dvapara Yuga. Kali Yuga is associated with the demon Kali (not to be confused with the goddess Kālī). The "Kali" of Kali Yuga means "strife", "discord", "quarrel" or "contention". According to Puranic sources, Krishna's departure marks the end of Dvapara Yuga and the start of Kali Yuga, which is dated to 17/18 February 3102 BCE. According to the Surya Siddhanta, Kali Yuga began at midnight (00:00) on 18 February 3102 BCE. This is also considered the date on which Lord Krishna left the earth to return to Vaikuntha. This information is placed at the temple of Bhalka, the place of this incident (see photo). According to the astronomer and mathematician Aryabhatta the Kali Yuga started in 3102 BCE. He finished his book "Aryabhattiya" in 499 CE, in which he gives the exact year of the beginning of Kali Yuga. He writes that he wrote the book in the "year 3600 of the Kali Age" at the age of 23. As it was the 3600th year of the Kali Age when he was 23 years old, and given that Aryabhatta was born in 476 CE, the beginning of the Kali Yuga would come to (3600 - (476 + 23) + 1 (As only one year elapses between 1 BCE and 1 CE) = ) 3102 BCE. According to KD Abhyankar, the starting point of Kali Yuga is an extremely rare planetary alignment, which is depicted in the Mohenjo-Daro seals. Going by this alignment the year 3102 BCE is slightly off. The actual date for this alignment is 7 February of 3104 BCE. There is also sufficient proof to believe that Vrdhha Garga knew of precession at least by 500 BCE. Garga had calculated the rate of precession to within 30% of what the modern scholars estimate. The common belief until Swami Sri Yukteswar Giri had analyzed the dating of the Yuga cycles was that the Kali Yuga would last for roughly 432,000 years after the end of the Dwapara Yuga (3102 BCE). This originated during the puranic times when the famous astronomer Aryabhatta recalculated the timeline by artificially inflating the traditional 12,000 year figure with a multiplication of 360, which was represented as the number of "human years" that make up a single "divine year". This was likely a purposeful miscalculation due to conflicts with one of the preeminent astronomer of the time Brahmagupta. However, both the Mahabharata (which was used by Aryabhatta in his calculations) and the Manu Smriti have the original value of 12,000 years for one half of the Yuga cycle. Contemporary analysis of historical data from the last 11 millennia matches with the indigenous Saptarishi Calendar. The length of the transitional periods between each Yuga is unclear, and can only be estimated based on historical data of past cataclysmic events. Using a 300 year (10% of the length of a particular yuga) period for transitions, Kali Yuga has either ended recently in the past 100 to 200 years, or is to end soon sometime in the next 100 years. Other authors, such as the revered Hindu guru Swami Sri Yukteswar in his book The Holy Science, as well as the influential Yogi Paramhansa Yogananda, believe that the Kali Yuga has already ended, and that we are now in an ascending Dvapara Yuga. This calculation is also supported  by modern day spiritual masters such as Sadhguru Jaggi Vasudev. Hindus believe that human civilization degenerates spiritually during the Kali Yuga, which is referred to as the Dark Age because in it people are as far away as possible from God. Hinduism often symbolically represents morality (dharma) as an Indian bull. Common attributes and consequences are spiritual bankruptcy, mindless hedonism, breakdown of all social structure, greed and materialism, unrestricted egotism, afflictions and maladies of mind and body. In Satya Yuga, the first stage of development, the bull has four legs, but in each age morality is reduced by one quarter. By the age of Kali, morality is reduced to only a quarter of that of the golden age, so that the bull of Dharma has only one leg. The Mahabharata War and the decimation of Kauravas thus happened at the "Yuga-Sandhi", the point of transition from one yuga to another. The scriptures mention Sage Narada to have momentarily intercepted the demon Kali on his way to the Earth when Duryodhana was about to be born in order to make him an embodiment of arishadvargas and adharma in preparation of the era of decay in values and the consequent havoc. A discourse by Markandeya in the Mahabharata identifies some of the attributes of Kali Yuga. Women will no longer get married. Traditional castes will disappear and everyone will belong to a single social class. Brahmins will not be learned or honored, Kshatriyas will not be brave, Vaishyas will not be just in their dealings, and the varna system will be abolished. The Brahma-vaivarta Purana has words spoken by Lord Krishna to Mother Ganga just before the beginning of the Kali Yuga (the age of quarrel and strife). The Kali Yuga began approximately five thousand years ago, that golden age is being described below by Lord Sri Krishna. Predicted in Brahma-vaivarta Purana 4.129. The fourth part of the Brahma-vaivarta is called Kṛṣṇa-janma-khanda. Chapter 129 is called Golokarohanam, because it describes how Krishna returns to His abode. This specific dialogue is between Lord Krishna and Mother Ganga. Verse 49 is a question by Ganga, verses 50–60 are Lord Sri Krishna's answer. "For 10,000 years of Kali such devotees of Mine will be present on earth. After the departure of My devotees there will be only one varna." Hence to protect ourself from Kaliman, it is believed that we should start doing japa, meditation, or any yoga such as Bhakti yoga, karma yoga, Raja yoga, and jnana yoga. But, chanting the holy name of God is the best path in Kali Yuga. Kali is the reigning lord of Kali Yuga and his nemesis is Kalki, the tenth and final Avatar of Lord Vishnu. According to the Vishnu Purana, Kali is a negative manifestation working towards the cause of 'the end' or rather towards eventual rejuvenation of the universe. Kali also serves as an antagonistic force in the Kalki Purana. 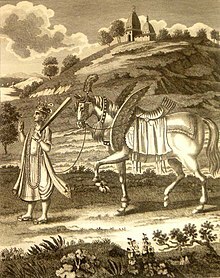 It is said that towards the end of this yuga, Kalki will return riding on a white horse to battle with Kali and his dark forces. The world will suffer a fiery cataclysm that will destroy all evil, and Shiva will destroy the universe. Brahma will create the universe a new, and then a new age (the next Satya Yuga of the following Mahayuga), will begin. "Once Parvati asked Lord Shiva, her husband: 'You have done good work for the people in all ages, but I am afraid for the people in the Kali Yuga; how will they safeguard themselves?' Then Lord Shiva told Parvati: 'I will appear in the Kali Yuga and I will create a new state, a new centre of religion - a most important place, where I will live and establish all the Gods there.'" "As I have told you before, the thing needed in this Age is work (karma). In every Age people have reached salvation through different types of action and sadhana (spiritual discipline), but in this Age one can reach liberation only through hard work. I want real, practical human beings and only he is a true human being who lives in accordance with this Age. We need not consider religion or caste, but look only to hard work." ab kaloo aaeiou rae : Now, the Dark Age of Kali Yuga has come. eik naam bovahu bovahu : Plant the Name, the Name of the One Lord. an rooth naahee naahee : It is not the season to plant other seeds. math bharam bhoolahu bhoolahu : Do not wander lost in doubt and delusion. The Kali Yuga is an important concept in both Theosophy and Anthroposophy , and in the writings of Helena Blavatsky, W.Q. Judge, Rudolf Steiner, and traditionalist ideologues such as René Guénon and Julius Evola, among others. Rudolf Steiner believed that the Kali Yuga ended in 1900. The traditionalists describe modern Western civilization as being in its Kali Yuga phase, in a state of degeneration and eventual collapse. ^ The Bhagavata Purana (1.18.6), Vishnu Purana (5.38.8), and Brahma Purana (212.8), the day Krishna left the earth was the day that the Dvapara Yuga ended and the Kali Yuga began. ^ "Lord Krishna lived for 125 years". The Times of India. 8 September 2004. Retrieved 31 December 2015. ^ Abhyankar, K. D. "Astronomical significance to two Mohenjodaro seals". Astronomical Society of India, Bulletin: 477. Bibcode:1993BASI...21..475A. Retrieved 16 December 2016. ^ Abhyankar, K. D. "Astronomical significance to two Mohenjodaro seals". Astronomical Society of India, Bulletin: 475. Bibcode:1993BASI...21..475A. ^ burgess, Ebenezer. Translation of the Surya-Siddhanta, A Text-Book of Hindu Astronomy With Notes, and an Appendix (PDF). Journal of the American Oriental Society, Vol. 6 (1858 - 1860). p. 141-498. ^ Alberuni’s India, Chapter XLII. p. 375. ^ Bibhu Misra Dev (15 July 2012). "The end of the Kali Yuga in 2025: Unraveling the mysteries of the Yuga Cycle". Retrieved 26 March 2019. ^ Sankara Balkrishna Dikshit, Robert Sewell. "The Indian Calendar: With tables for the conversion of Hindu and Muhammadan into A.D. dates, and vice-versa": 45. ^ Yogananda, Paramhansa. Autobiography of a Yogi. BiblioBazaar. pp. 200–201. ISBN 978-0-554-22466-4. ^ "The Mahabharata, Book 3: Vana Parva: Markandeya-Samasya Parva: Section CLXXXIX". Sacred-texts.com. Retrieved 20 January 2013. ^ "Chap. Vii". Sacred-texts.com. Retrieved 20 January 2013. ^ The Teachings of Babaji, 25 December 1981. ^ "Having some doubt, Kartikeya, son of Lord Shiva, once asked what would happen to man during the Kali Yuga when there would be so much trouble in the world. The Holy utterance of Lord Shiva was that he would manifest in the Kali Yuga to uplift the world and liberate those who turn to God. Shiva now lives among us in Shri Babaji, who is doing the services for mankind now from Herakhan Vishwa Mahadham." The Teachings of Babaji. 30 October 1982. ^ The Teachings of Babaji. 21 March 1983. ^ "Enabling Gurmat Knowledge". SikhiToTheMAX. Retrieved 20 January 2013. ^ Christopher Bamford (ed.). Spiritualism, Madame Blavatsky & Theosophy: An Eyewitness View of Occult History : Lectures by Rudolf Steiner. ^ Kevin T. Dann (2000). Across the Great Border Fault: The Naturalist Myth in America. Rutgers University Press.